Toyphabet: Collaboration with Viktor Koen | Can someone please explain...? I’ve once again had the honor of collaborating with the darkly powerful illustrator, Viktor Koen, to write the text for one of his books. As some of you may know, we worked together on Lexicon: Words and Images of Strange (AtticChild Press, 1996). 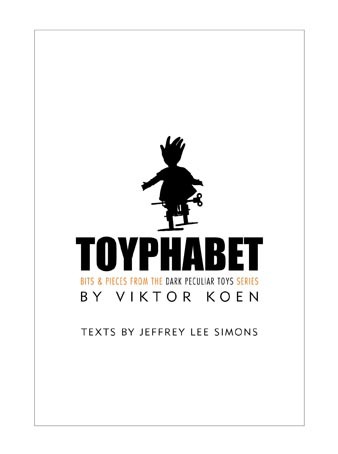 Viktor’s new project is Toyphabet, now in book form for the first time. And I got to write text to go with his disturbing, thought-provoking images — which is inevitably challenging and immensely satisfying. Unfortunately, or fortunately, depending on your point of view, TOYPHABET is a limited edition book made specially for the 2OO9 New York Comic Con and is carried exclusively by Baby Tattoo Books at booth#1622. TOYPHABET prints have been exhibited extensively as part of the series Dark Peculiar Toys, around the world, including Berlin, Athens and Beijing. This illustrated typeface is included in numerous books about typography, digital art and fantasy and has been featured in a full length article by Steven Heller in the prestigious Baseline magazine. This is the first time the letters have been available in book form, featuring texts by author and long time collaborator Jeffrey Lee Simons. Looks fascinating. Lots of luck.